Bride and groom walk in the wilderness. 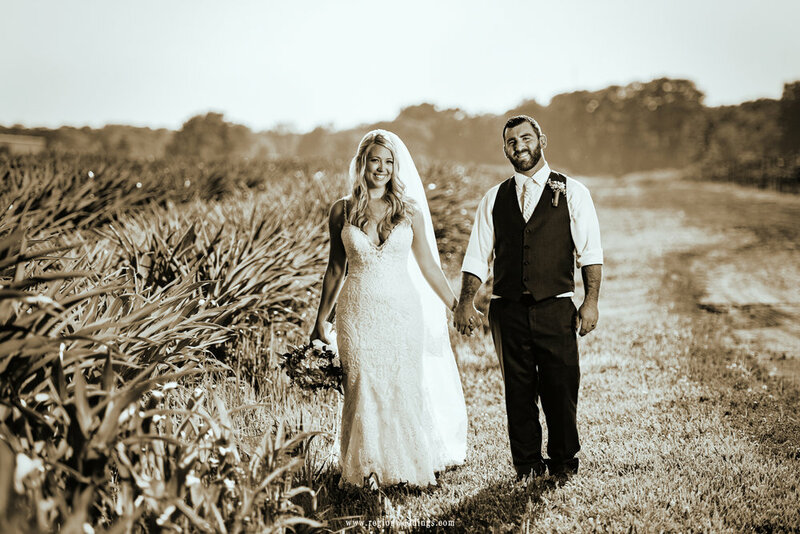 It was a hot summer day for Ashley and Zach's rustic barn wedding at County Line Orchard. Fans were working overtime keeping the girls cool as they prepped for the day in the grain silo that overlooks the orchard fields. Bridal prep in the grain silo at County Line Orchard. The bride gets into her dress at County Line Orchard. 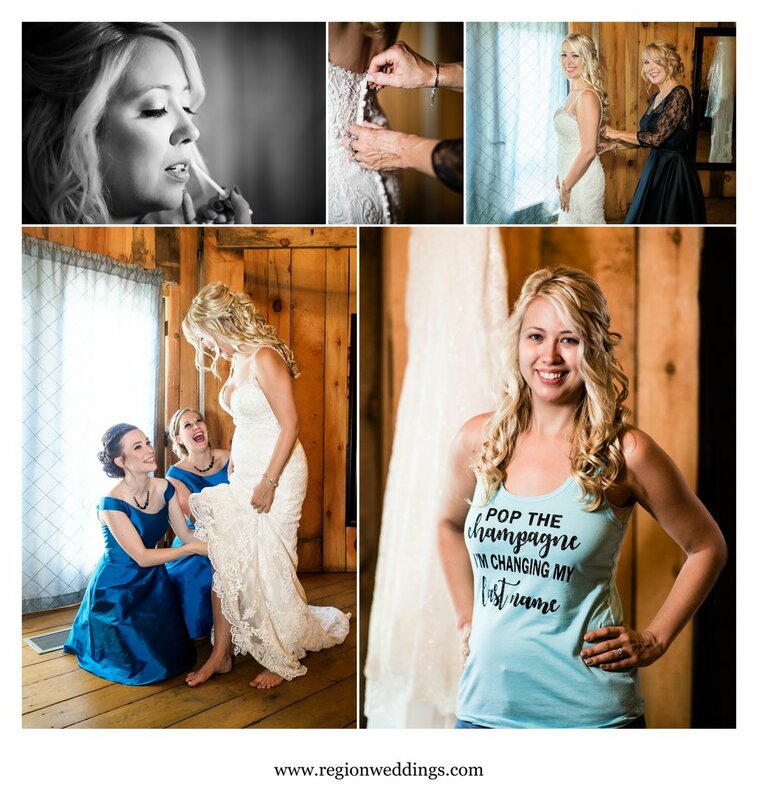 The grain silo isn't just a great spot for bride and bridesmaid prep and an area to pop champagne, it's also great for bride portraits and Ashley certainly had a great dress to show off. She asked for a traditional wrap around dress photo like her mom had at her wedding in addition to my usual "bride in the doorway" image that I love to take at this venue. Bride portraits inside the County Line Orchard grain silo. Second photographer Kerrie was with the guys as they poured a pitcher of beer in lieu of champagne. Zach had his boutonnière placed by his mom and then it was out into the orchard fields for pictures. 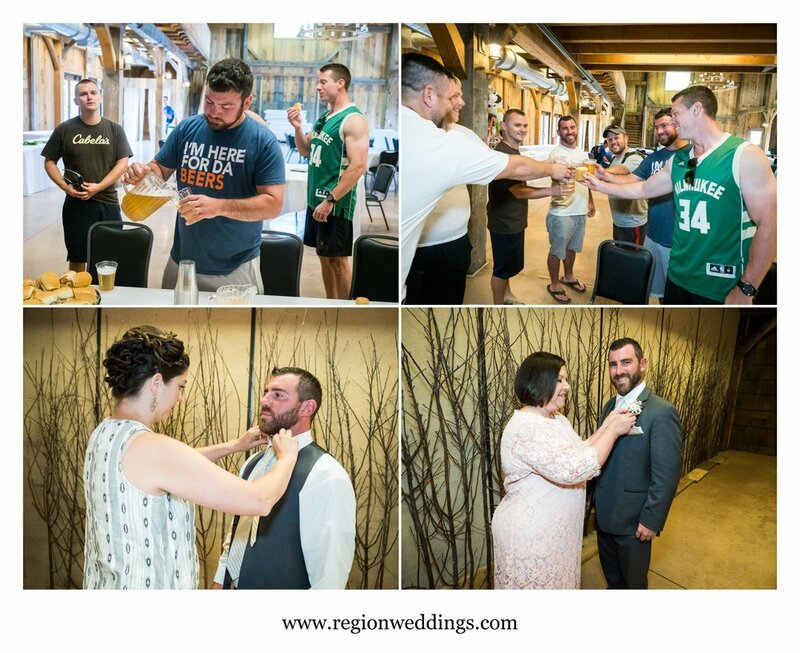 Groomsmen prep at County Line Orchard. I took the girls out for pictures while Kerrie took the guys. Ashley looked incredible in her dress and Zach was rocking his custom made boutonnière for sure. Bride and groom are ready for their big day. 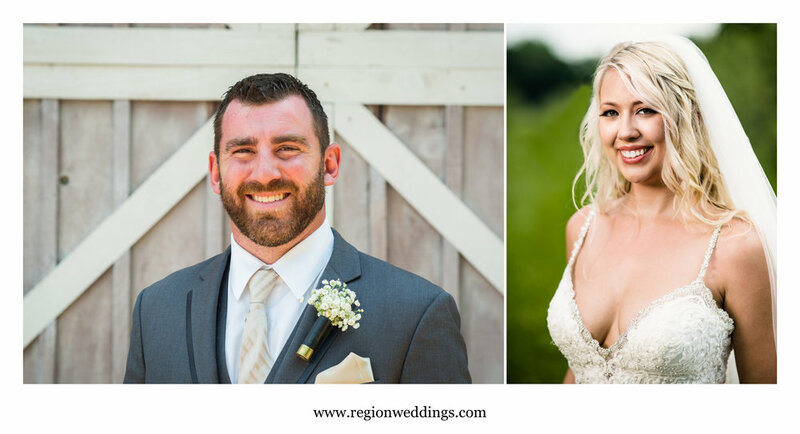 I love the wooden fences out in back of the barn and I thought Ashley's flowers would really pop against the background. To show off her train once again, we blocked off the road a bit to capture the silo as our background. The bride leans back against the wooden fences of County Line Orchard. A beautiful bride shows off her dress with the County Line Orchard grain silo in the background. A big shout out to Ashley's bridesmaids who let me take them out into the punishing heat and sun in back of the big barn. You can see exactly what they think of the idea in the photo next to the silo. At one point I told them to wear sunglasses and walk toward me like I was the weatherman!! :) It looks like Kerrie kept the guys sheltered under the tractor limo for their pictures. Bridesmaid photo fun at County Line Orchard. Groomsmen photo fun at County Line Orchard. Outdoor wedding at County Line Orchard. Wedding ceremony at the Room of Trees at County Line Orchard. After the ceremony we took family group pictures and then it was time for wedding party and the newlyweds. Soon the sun would go down and time to light up the dance floor. Bride and groom portraits in the apple orchard. Wedding party group photos at County Line Orchard. Bride and groom share a romantic kiss in the farm fields underneath a blue sky. The iconic red barn of County Line Orchard. We don't always get an opportunity to capture the wedding venue decorated and not filled with guests yet, but on this day we did and it's a spectacular venue as seen from above. The decorated reception ballroom at County Line Orchard. Rustic wedding decorations inside the big barn. After Ashley's 1993 commitment to "never get married" was revealed, it was time to celebrate that broken promise on the dance floor. Dance floor fun at County Line Orchard. A blue hour wedding portrait at County Line Orchard. 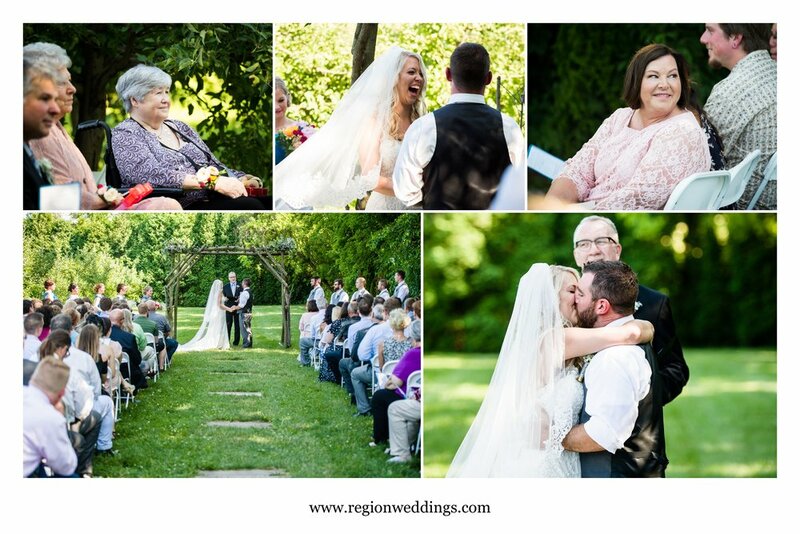 I hope you have enjoyed this sneak peek look at Ashley and Zach's June wedding at County Line Orchard. Please do fill out the Contact Form to inquire about wedding photography for your big day. Follow the social media channels listed below for more images from this wedding and others.